Divisadero is the train stop that overlooks the joining of Tararecua Canyon and Urique Canyon. :Looking at the tops of these canyons, the scenery seem endless. The newest feature attraction is the Copper Canyon Adventure Park, a nature preserve offering some exciting high flying adventures! 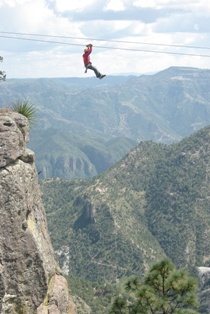 The “Copper Canyon” Adventure Park is located in the near the railway station of Chihuahua to the Pacific known as “El Divisadero”. 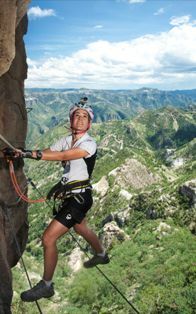 Besides the natural beauty of the area and the ancient culture of Tarahumares that inhabit the region, now has one of the most impressive mountain parks in the world. This has a set of 7 zip lines and two suspension bridges to add nearly 5 kilometers, comprising a via ferrata, repel, rock climbing and a small suspension bridge accessed via a Tarzan jump, a restaurant with spectacular terraces and glass floor, ancient walking trails, mountain bike rentals, camping sites, horseback riding and finally, the third longest cable car in the world, with 3 miles of cable without intermediate towers. cabins come to La Mesa Bacajipare lookout point featuring a stunning panoramic view of the union of two Canyons, the Tararecua Canyon and the Urique Canyon, with a depth of more then 1879 meters. 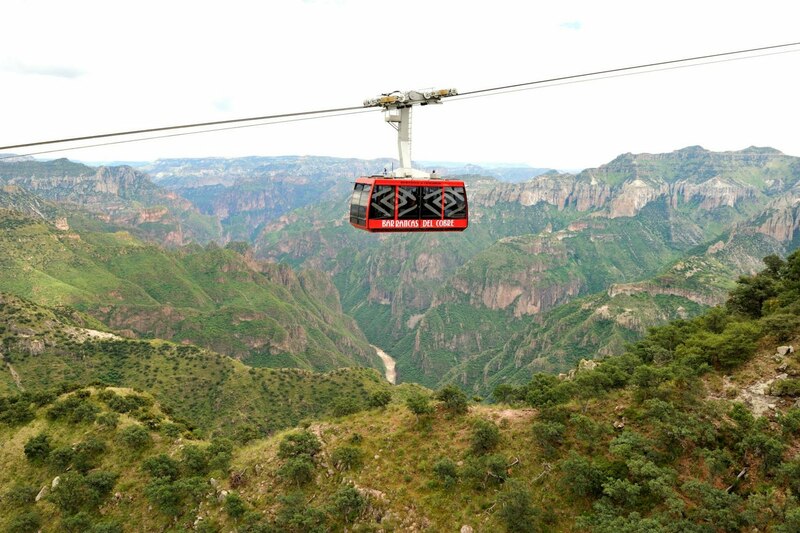 The Barranca del Cobre Adventure Park , has a system of zip lines that is the longest in the world, allowing flights with heights up to 400 meters and a speed of 65 to 110 kilometers per hour. 5 kilometers of total length over 7 jumps and 2 suspension bridges. Visitor returns The comfortably aboard the cable car to the place where the journey began. Starting with a drop of 45 meters semi Repel to continue climbing from rock through a suspension bridges, and rock walls and make a Tarzan jump. After a single wire bridge with two safety lines and climbing vertical line to finish. going by lake Arareko, Valle de Los Dioses, the Jesuit Mission in San Ignacio and a visit to a museum with 17th century paintings.